Demna Gvasalia of Vetemens fame debuted his menswear collections for Balanciaga this summer. Unfortunately, his take on the sculptural heritage of the house translated into a two-dimensional vision for the future. Jacob Rosengren gives his verdict of the collection by using look 1 as his case study. Elongated sleeves, exaggerated shoulders, deconstructed hoodies and oversized shirts – Demna Gvasalia is dictating the proportions of fashion at the moment. Alongside Gucci’s Alessandro Michele, Gvasalia has, in just over a year, taken a short cut to the Vogue’s top ten of fashion, by creating clothing that appeal to the trend obsessed. So influential is the direction of this Georgian fashion designer, that a litany of designers such as Michael Kors, Jacquemus and Rodolfo Paglialunga at Jil Sander are jumping on the bandwagon to stretch, expand and cut up their collections to cash in on the moment. One of the reasons Gvasalia has become an overnight success is the singularity of his vision for Vetements, the brand he co-founded with his brother in 2014. Over the course of just few collections, he has managed to establish a visual vocabulary that is easy to recognize with plenty of impact. His slow design evolution translates into shapes, signs and shades that effortlessly roll from one season to the next, easing the eye into the at-times-extreme aesthetics although simultaneously making it hard to differentiate his collections from each other. But whilst there are plenty of reasons to celebrate Gvasalia’s vision at Vetements, his work at Balenciaga, where he took on the role as the creative director mere a year after opening his own label, is not translating into something that feels synonymous with this venerable house. Particularly, his debut menswear collection was less than impressive. Like with any first collection created for a brand with more then half a century of heritage, Demna Gvasalia visited the Balenciaga archives in search of inspiration. The starting point for his spring summer 2017 menswear collection was an unfinished coat tailored by Cristóbal Balenciaga for himself. 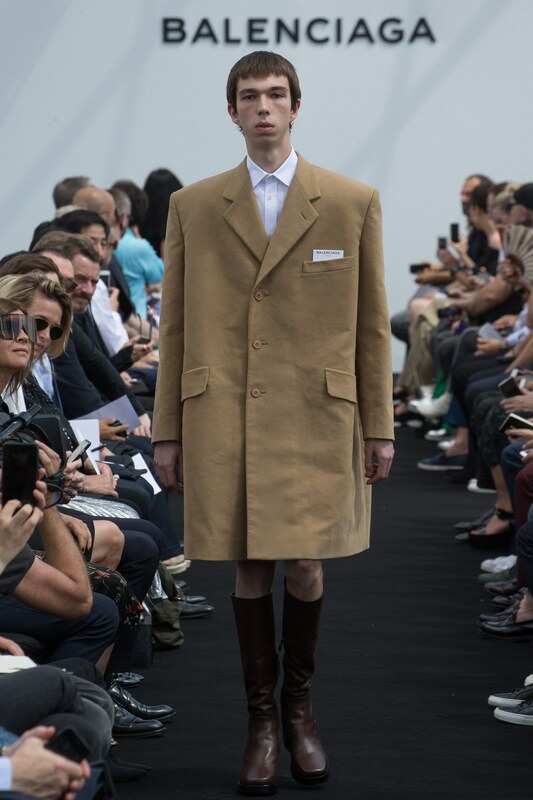 Now completed, the coat opened the show and thus provided a template for Gvasalia’s enlarged vision for the Balenciaga man. Worn with a white shirt and almost-knee-high cherry chocolate brown boots, this boxy plain beige coat is conservative due to its colour and cut. Yet, at the same time, it begins to challenge the norms of proportions – not because the way this coat has been engineered but because the way it relates to everything else around it. The trick with Gvasalia’s work is not in the design – rather, everything is down to the styling. 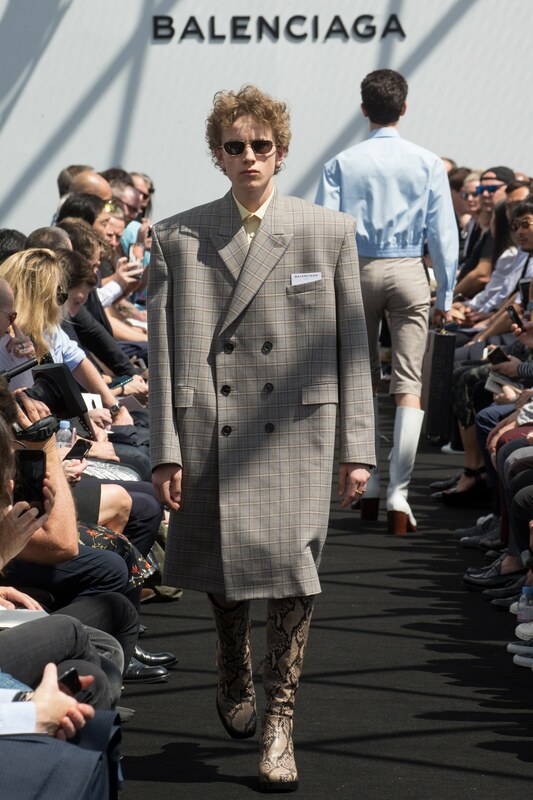 In the case of look 1, what would appear like a perfectly standard coat on a man of certain built, drowns the slim teen modelling it on the runway. 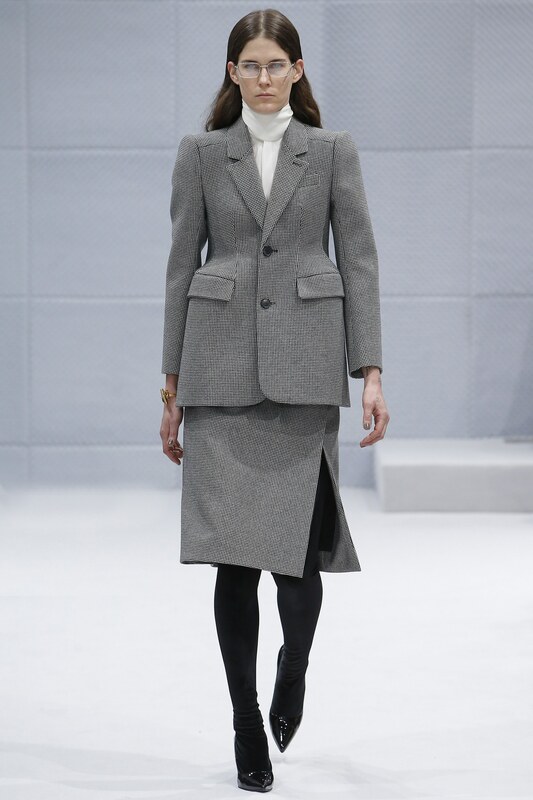 Lack of trousers and the narrow catwalk that frames the shoulder line further dislocates the coat. And despite its initial appearance as a statement-making opener, this coat is in fact the subtlest in the collection that grows bolder and sharper from one outfit to the next with interjections of skintight tailoring in between only to amplify everything else. Design thinking, creative cuts and challenging forms is what Cristóbal Balenciaga was known for. Like a good sculpture, one needs to inspect Balenciaga’s work from all angles in order to appreciate the full effect of the form and artistry. In fact, it is the side and back view that most often reveals the genius of his design approach. Nicolas Ghesquiere who performed the role of a creative director of the house between 1997 – 2012 certainly honoured this legacy by thinking in 360 whilst heightening the tactile qualities of the house signature by bringing new focus to sophisticated and often advanced fabrications. Whilst on the surface these trademarks appear in his work for Balenciaga, it is merely by spreading the shoulder line sideways that Demna Gvasalia attempts to address the codes of the house. One-dimensionally flat, the result is reminiscent of the 18th Century crinolines styled with oblong hoop panniers that were used as a method for presenting the front of the garment as an imposing spectacle of wealth and power. 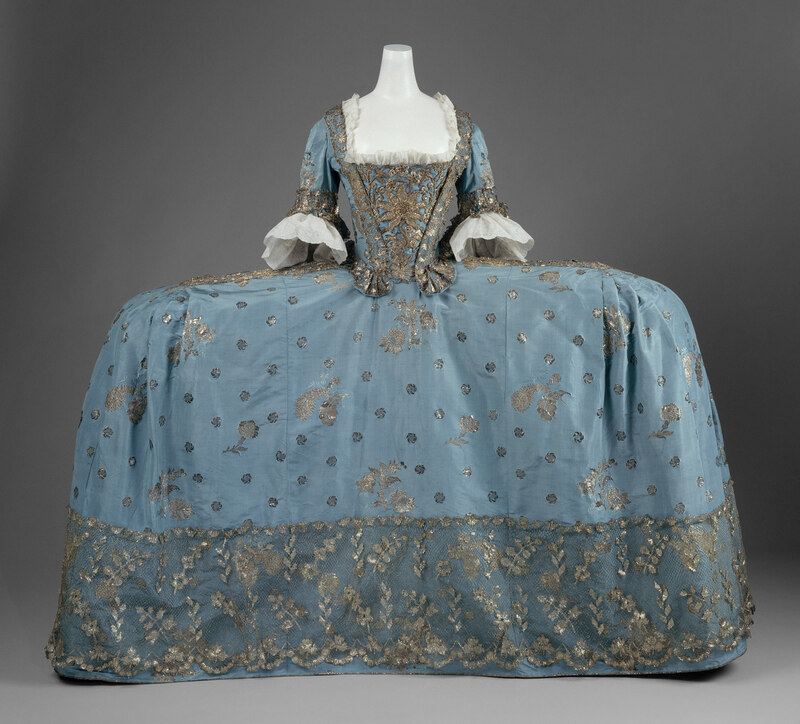 Yet, in this display of fashionability, the woman underneath became secondary with the garment intended more for impact and the eyes of others as opposed to the comfort of the wearer. Similarly, Gvasalia’s work seems styled for the 21st century social media show where fashion impact is measured in ‘likes’ and Instagram with its miniature window into the world of mediated life provides a flattened picture of the reality where only the initial impressions count. Applied to band t-shirts, varsity hoodies and bomber jackets, Gvasalia’s oversized, elongated and deconstructed look works well for the too-cool-to-care junior market of Vetements. 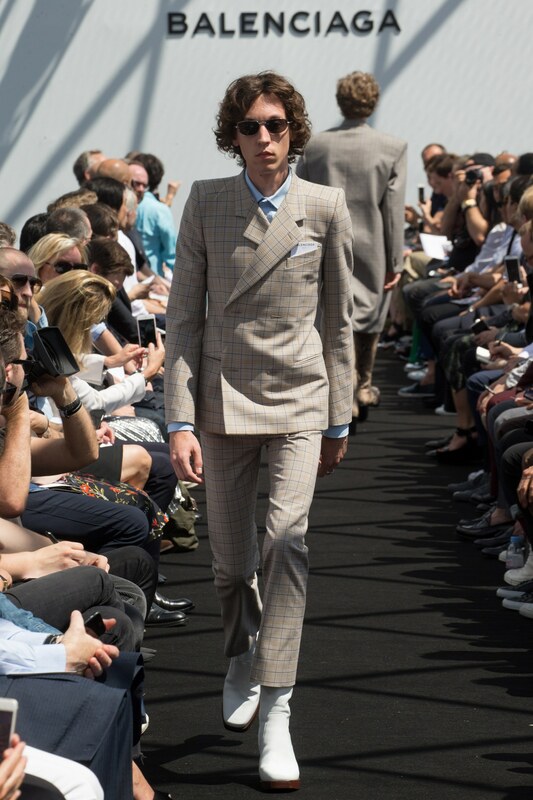 There is a genuinely charming nonchalance to it and the clothing suits the streets (particularly when seen outside a fashion show). Yet, in the fickle market, creating a menswear collection for a house that was built for dressing women was perhaps a poisoned chalice. Neither Nicolas Ghesquiere nor Alexander Wang was able to crack it despite successfully making clothes for women that were both innovative and desirable. Whilst Gvasalia’s vision for Balenciaga’s womenswear seems promising, the only way he is honoring the legacy of the house is by not being able to translate the heritage codes for men. Instead of worrying so much about the image and the catwalk, he would be better off capitalizing on the momentum of his Vetements work which is based on creating clothing that is uncomplicated and ready for reality. As well as flattering our appearance, the role of clothing is to embody us, not the other way around.